Five months before the General Services Administration (GSA) bought the property from the city of New York, it hired Historic Conservation and Interpretation (HCI), an archaeological firm, to write a portion of the environmental impact statement for the site. In March 1989, a Memorandum of Agreement (MOA) was signed by the Advisory Council on Historic Preservation and the GSA. It stipulated that the archaeological investigations conducted at the site would conform with a research design that would establish the historic significance of the project area and the archaeological materials found. However, the archaeological fieldwork failed to proceed within the framework of the MOA. HCI's Cultural Resource Survey established the area as a section of the African Burial Ground but predicted that any significant archaeological remains would have been destroyed by nineteenth- and twentieth-century construction: "The construction of deep sub-basements would have obliterated any remains within the lots that fall within the historic bounds of the cemetery." However, it was still possible that there were human burials preserved in Republican Alley, an area formerly located between Duane and Reade Streets. In May 1991, the GSA hired HCI to investigate the possible human remains in the alley. The firm found human bones. 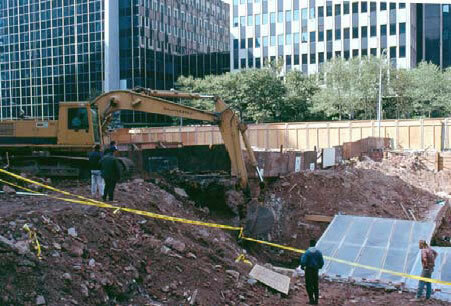 In September 1991, full-scale excavation began under the direction of Edward Rutsch, the chief archaeologist at HCI; and on October 8, 1991, GSA regional director William Diamond held a press conference to announce the discovery of the remains. The Metropolitan Forensic Anthropology Team (MFAT) at Lehman College was responsible for storage of the remains. The GSA, however, had only vague ideas about what to do with the remains, and the New York Times reported their use of the "coroner's method" to excavate, which is "appropriate for police identifications, not for the interpretation of the ways of life in past human communities" (Blakey). Meanwhile, the African community were outraged that they had no control over the fate of their heritage, and that white bureaucrats were handling the excavation. (See Controversy and Race Theory.) HCI and MFAT included only one anthropologist who had had experience studying African American populations, and they struggled to produce a research design stating conservation measures and scientific study goals. In addition, public money was being lost, and there was pressure to get the excavation done quickly. The project team felt too overworked to properly conduct research on the remains. In December 1991, an amendment to the MOA was signed by the Advisory Council, the New York City Landmarks Preservation Commission, and the GSA stipulating, in part, the preparation of a research design. In July 1992, excavation was halted by the GSA, partly because of the lack of an acceptable research design. John Milner Associates had replaced HCI as the GSA's archaeological consultant on July 1, 1992, and in late 1992, biocultural anthropologist Dr. Michael Blakey, then of Howard University and currently of the College of William and Mary, was appointed Scientific Director of the African Burial Ground Project. 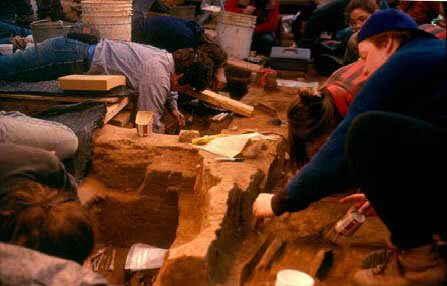 Howard University received a contract in 1993 to conduct the post-excavation research. In the spring of 1993, a research design prepared by Howard University and John Milner Associates was accepted by GSA. The research design and analysis addressed "the cultural background and origins of the burial population, the cultural and biological transformations from African to African-American identities, the quality of life brought about by enslavement in the Americas, and the modes of resistance to enslavement" (Howson). No member of the Howard University team participated in the fieldwork at the site, but the team made every effort to minimize the loss of information that can result from the lack of continuity between fieldwork and analysis.